We're here again with another MFT Color Challenge! Join us as we create with this unexpected color combination. This challenge features vibrant colors to inspire you — Orange Fizz, Limelight, Grapesicle, and Grape Jelly. 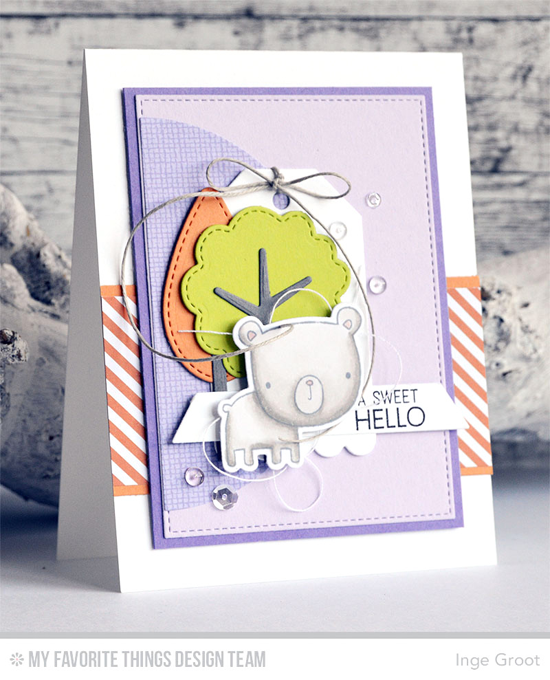 Whimsical Limelight and Orange Fizz trees set the scene on Inge's take on Color Challenge 44. Her scene also includes a Grapesicle sky to continue the quirkiness of her design. Such a fun background for the bear from the Forest Friends stamp set! Julie features the Dainty Scallop Cover-Up Die-namics with this juicy color palette. Not a single stamp was used on this stunning design! The white background allows the colors to really shine. Barbara creates colorful magic with her Peerless Watercolors. I just LOVE how the there stands out amongst the riot of colors! Karin's funny scene takes some liberties with the colors as she added some red and aqua for her coloring of the silly aliens, but the colors of this challenge are the focus. 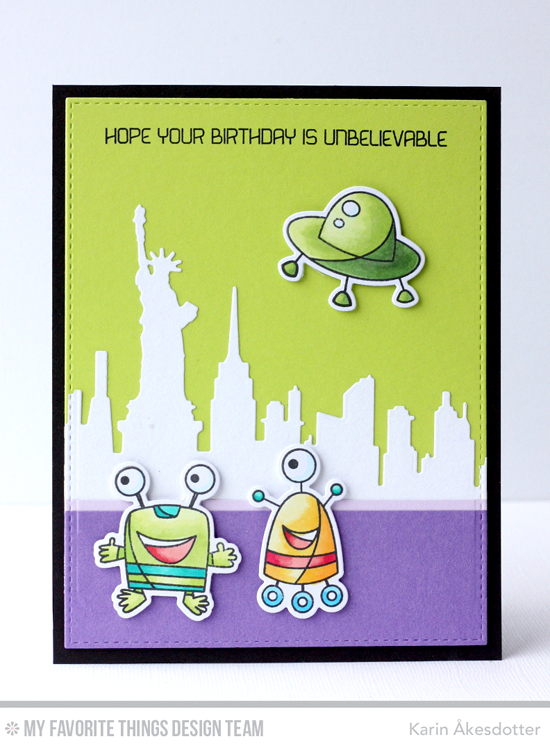 I adore the white New York Skyline behind the friendly little guys from the Out of This World stamp set and Die-namics. Congratulations, Andreea Raghina! You are the randomly selected winner of the MFT Color Challenge. You can view all the entries from the last challenge HERE. You have until Wednesday, May 11th, at noon EDT to add your link and be eligible for the prize of up to $20 in MFT Cash. Winners are chosen at random, so everyone has a chance! The prize is a $15 Gift Voucher to My Favorite Things, but if you use MFT stamps and/or dies in your project, you’ll receive an extra $5. Yummy! What a fun juicy set of colors!! 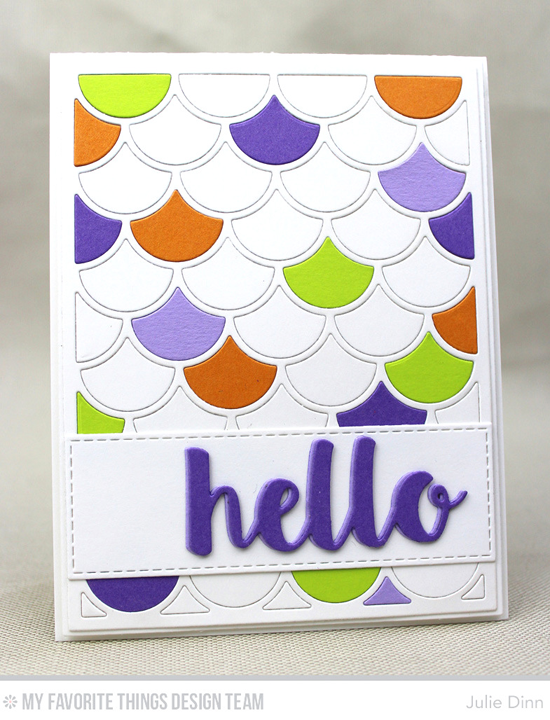 Fun colors and fabulous DT inspiration!